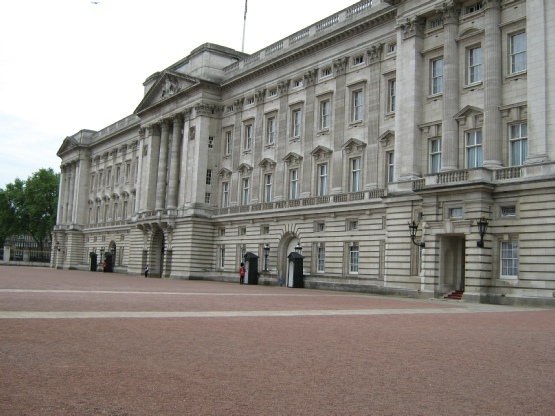 Buckingham Palace was built upon the site of a house owned by John Sheffield (The first Duke of Buckingham / Normanby), which was sold the year after his death in 1721, to George III. (The mad' King, whose reign saw the American War of Independence in 1775, and eventual loss of the British colonies). John Nash architect and Surveyor General of the Prince Regent (Prince of Wales, George Augustus Fredrick son of George III), built and redesigned many of London's now famous landmarks. He built Regent Street, designed grassed parks and re-designed Buckingham Palace in 1826.
is often mistaken for a front entrance.